FxCraft Manual Trader is a convenient tool for manual trading on the JForex platform (Dukascopy). It facilitates and accelerates execution of many standard actions, which often take our precious time and increase the chances of making mistakes. Great training tool, during its launch as a Strategy in Historical Tester. It is perfectly suited for dynamic scalping and traditional day-trading. The tool based on Luktom Manual Trader. Trade with just one mouse click or keyboard shortcuts (@ Market and pending orders). To place an order, click the SELL (BUY) button, or use the defined keyboard shortcut. If the ‘Pending’ box is checked, your pending order will be placed with the activation price equal to the value of the nearest box. The application automatically detects what type your pending order should be (STOP or LIMIT), depending on the location of a current price in relation to the entered price. Set parameters for long and short positions separately. Automatically set stop loss and take profit on selected levels. The values of stop loss and take profit can be given in pips, or as a set price. It is also possible to disable this option. See dynamically calculated lot size. Lot is calculated based on the percentage of capital which can be accepted as a maximum loss, set stop loss value and a commission charge, according to the formula: (Balance * Risk-commission) / (SL * PipValue). Additionally, you can ask the capital, which will be calculated percentage of the risk. This capital we ask in the “Equity Strategy”. Lot is calculated and displayed in the ‘Amount’ box by clicking the ‘Calc’ button or the SELL / BUY button. To disable this option and play with a fixed lot, uncheck the ‘Risk’ box. Set ‘slippage’ for each position. Open positions provided that spread is not too high. It is enough to set a maximum spread at which a position is opened in the ‘Max Spread’ box. 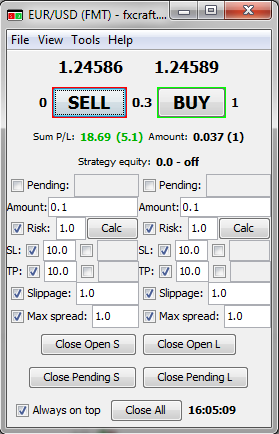 Use ‘trailing stop’ and ‘breakeven’ in positions opened by the program. While launching the program, and during its working you can set parameters for trailing stop and break even. For trailing stop, set the number of pips that a position has to earn to activate trailing stop, the number of pips indicating how far from the price stop loss will be shifted and the Step at how many pips stop loss will be moved. For Brake Even, set the number of pips that a position has to earn to activate Brake Even and the number of pips from open order price where SL will be moved. Close positions with just one click or a keyboard shortcut. All open short (long) positions can be closed with the ‘Close Open Shorts’ (‘Close Open Longs’) button or the defined keyboard shortcut. All pending short (long) positions can be closed with the ‘Close Pending Shorts’ (‘Close Pending Longs’) button or using the defined keyboard shortcut. All positions (short, long, open and pending) can be closed with the ‘Close All’ button or using the defined keyboard shortcut. Ability to edit each order separately in an additional table of orders, which can be opened by Tools-> Order Tab. Partial close. The closed portion is defined as a percent of the current lot size. Reverse order (option: Reverse). This option closes the selected order and opens the opposite order of the same lot size, SL and TP in pips are equal to closed positions SL and TP . Number of open positions divided into short and long (they are displayed directly on the keys, “SELL” and “BUY”). Total profit / loss (“Sum P / L”) in the account currency, and next in parentheses in pips. If there is more than one open position we calculate the breakeven level. Value of Total profit/loss is distance beetween breakeven level and current price. Both values take into account commissions. The total size of the positions (“Amount”). The size of the positions on the short position is negative, while on the long position is positive. Next in the parenthesis shows the number of all open orders. Time of last tick is displayed. The “Label” parameter is used to define orders to be handled by an instance of the program. One instance will serve only those orders for the instrument, which opened with a given “Label”. You can hide selected part of the Manual Trader. You have option to reverse the position. When you open a long position all short positions are closed and vice versa. To enable this option, check the box “reverse position”. Extract the downloaded archive. You find there are two versions of the program to run as a strategy or as a plugin. Then, to run the program as a strategy, open strategy tab on JForex platform by Tools -> Strategies. In Strategy tab, open the file you downloaded, and now you can start FxCraft Trader Manual. To run program as a plugin in the “Workspace” right-click in the “Plugins” and select “Attach”, then in the dialog box select the plugin file of the program. Run the plugin by clicking on it with the right mouse button and select “Activate”. I would like to play on several currency pairs at the same time. How to do it? In JForex platform in Strategy tab to open multiple instances of the same product (strategy). Select every time the same file. Now you can run the program on each instance separately, in each choosing a different currency pair. I would like to add my own functionality to FxCraft Trader Manual. Is this possible? Of course. We can customize FxCraft Manual Trader for your individual needs. Please write to us at orders@fxcraft.biz, and we will together work out a solution. Added ability to define your own keyboard shortcuts. The possible combinations are: a single character (for example: “s”) or a combination of the function key (Ctrl, Alt, Shift) and single character (for example: Ctrl + s). Added menu at the top of the program. The most useful options in this menu is ability to hide some functionality of FMT. Fixed and improved some of the functionality. Added a table with the order in which you can modify each order separately (Closing, partially closed, reverse, modify SL and TP). Orders table you can open by Tools-> Order Tab. Added Trailing Step options in Trailing Stop. Added ability to edit Trailing Stop and Brake Even without exiting the program. By Tools-> Options. FxCraft Trader Manual in two versions. As a Strategy (as for now) or as a Plugin. Option “Preview” was added. It allows you to visually see on the chart where you put the order. On the chart opening price, stoploss and take profit line will be displayed. These lines can be moved and set in a convenient location. Automatically calculates the position size from the risk (if the option is select when opening order). To use the “Preview” option you need to check “Preview” checkbox and then click “SELL” or “BUY”. Then instead of opening order on the chart will be displayed lines. Order will be realized by clicking the “Entry”. NOTE: If you have several charts open with a chosen instrument then line will be drawn on one of these charts (but always the same). Trial version 0 Download and try!